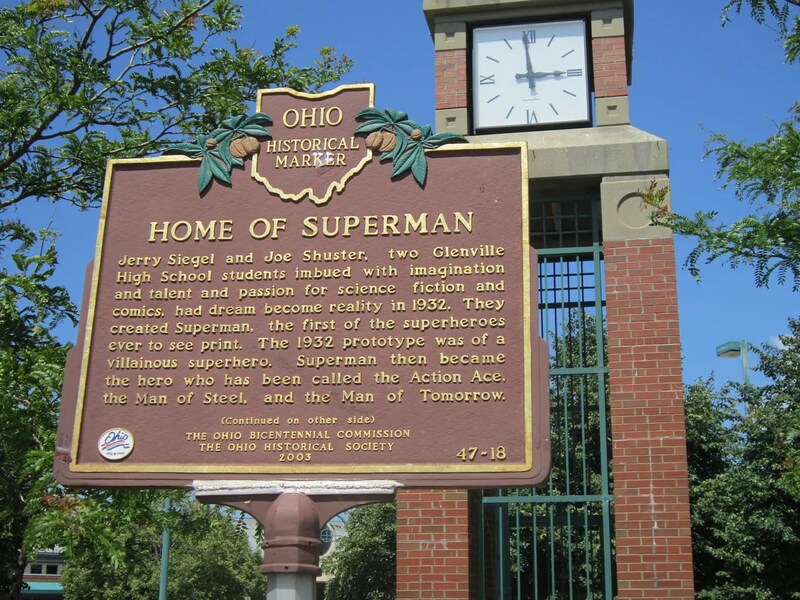 2013 Road Trip Photos #30: Man of Steel, Sons of Cleveland « Midlife Crisis Crossover! 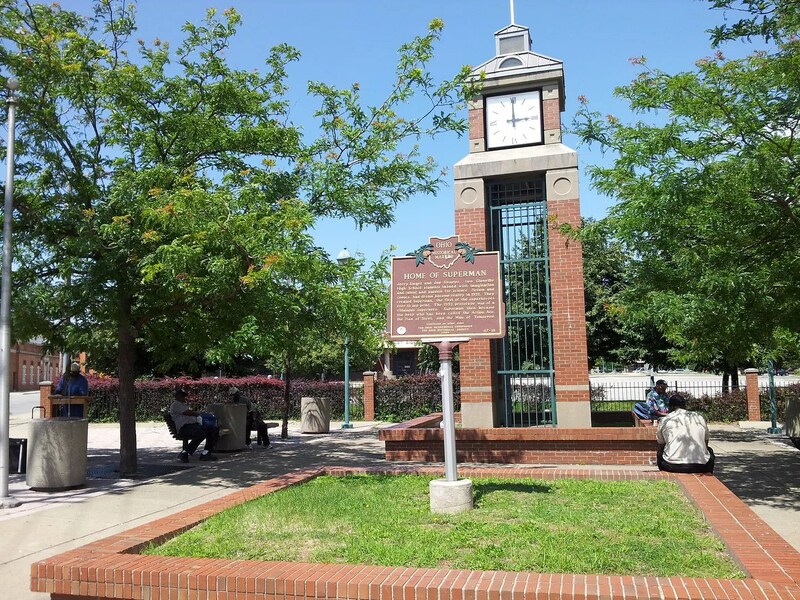 Day Eight of our nine-day road trip continue in Cleveland due southeast from the Rock & Roll Hall of Fame in the kind of neighborhood that wouldn’t normally attract tourists if there weren’t some kind of major draw. As fate would have it, in 1938 a pair of young men named Jerry Siegel and Joe Shuster would put their heads together to create an intellectual property (years before the term became commonplace and meaningful) that would bend pop culture into new shapes and change the course of entertainment history. Yes, Superman! The hero who put super-heroes on the map, who convinced multiple 20th-century generations to look up in the sky, who fought his way into the hearts of kids of all ages, who helped fund DC Comics into the monolithic corporation they are today, and who starred in the very first super-hero movie I ever liked. The dreamers responsible were both from Cleveland, and their hometown couldn’t be prouder. You’ll note the souvenir Superman Celebration 2012 T-shirt my wife selected for this photo op. I have a matching one myself. 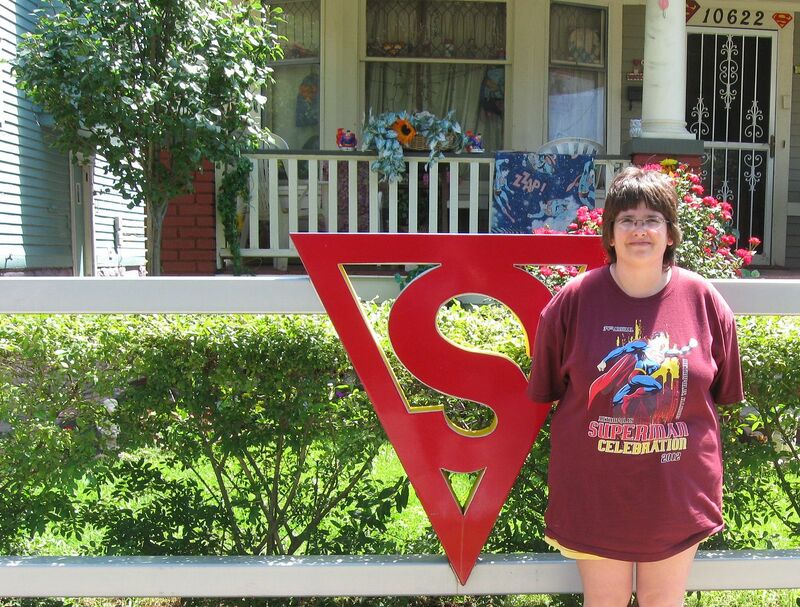 She thought so highly of Superman: the Movie in her youth that she memorized it. Every word. Literally. She’s always been impressive like that. The S-shield shown above is mounted on the front of the home where Jerry Siegel grew up. A kindly lady sitting on the front porch, whose parents now own the house, was gracious enough to permit well-meaning rubes like us to take photos. 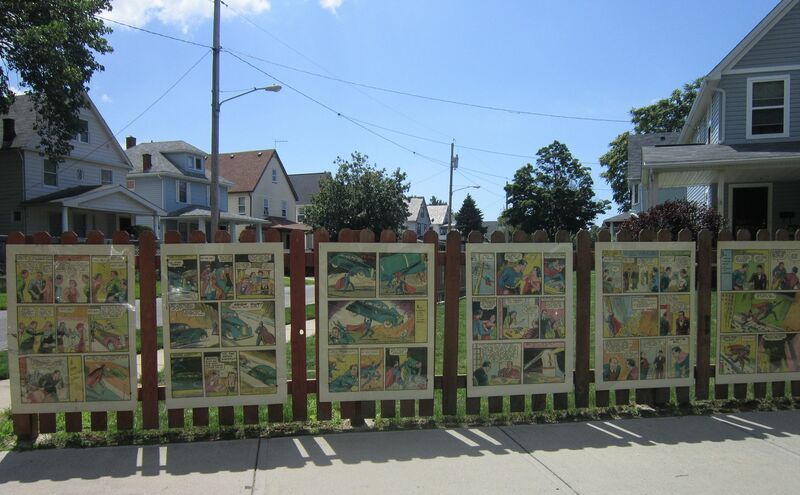 A helpful plaque on the other side of the fence provides visitors with context and inspiration. 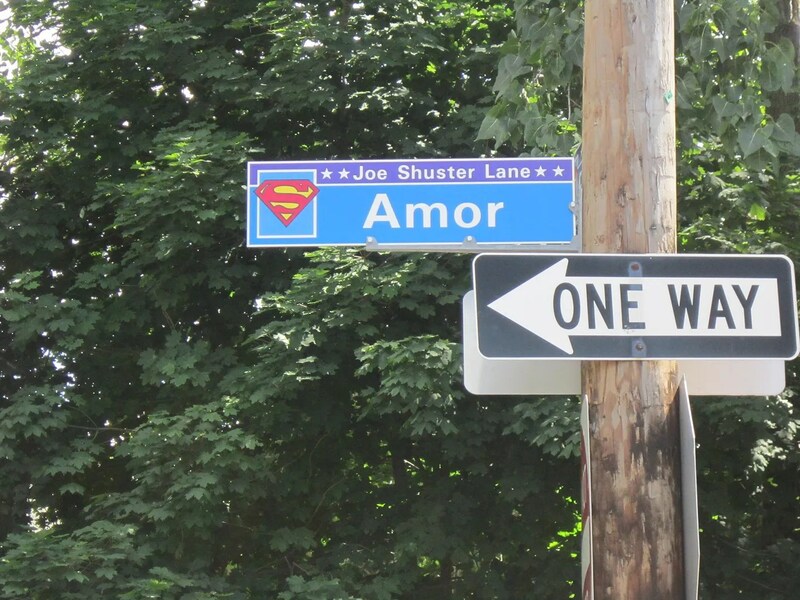 His best friend Joe Shuster lived a couple of streets down, easy walking distance if you feel safe leaving your car out in the open. I wouldn’t recommend it. The vanity street signs are cute, though. 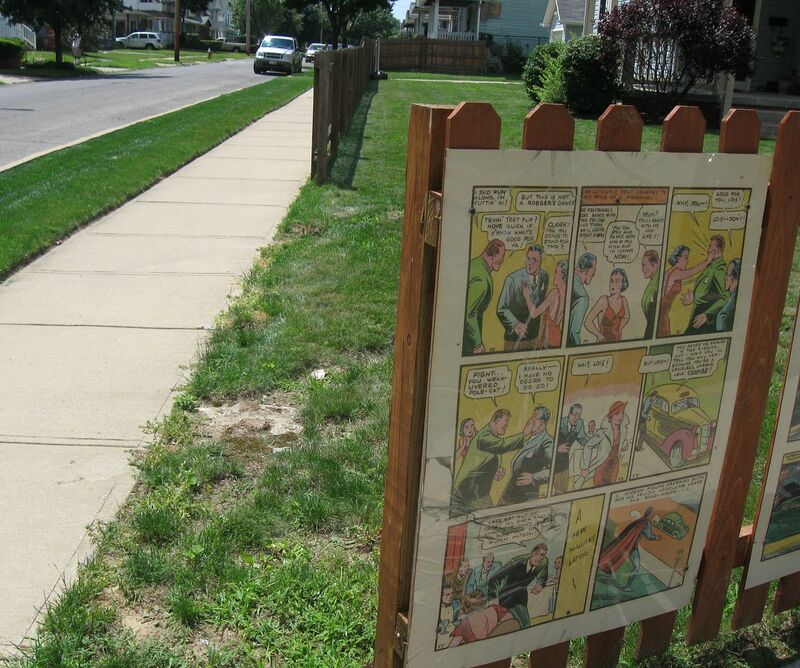 Whoever dwells in Shuster’s old house wasn’t readily approachable, but the exterior signage takes its own special form: an oversize reprint of Superman’s first appearance in Action Comics #1. His wasn’t the only story in that issue, but nearly everyone else in that comic now languishes in obscurity. Five or ten comics fans might make a case for Slam Bradley, but you’re not obligated to give them the time of day. This is a closeup of the final page. Shuster’s art as of June 1938 may not resemble what we’re used to seeing in today’s computer-colored four-dollar pamphlets, but it’s a good deal more noteworthy than some of his forgotten contemporaries. You’ll note in his debut that Superman is jumping from place to place here, as flying wasn’t yet part of his repertoire. Building up his legend in its entirety took many years, many tales, and many hands. 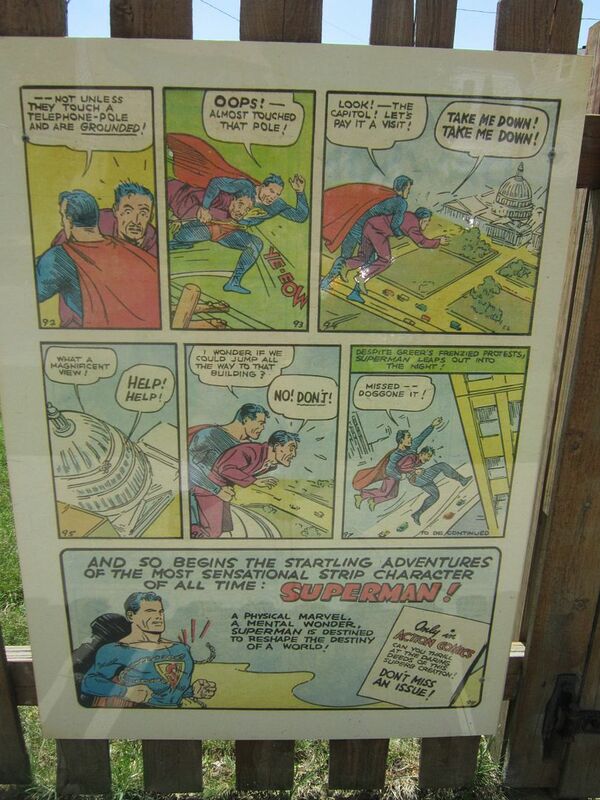 The fence formerly contained his entire Action #1 story. Sadly, a few months before our trip, a drunk driver knocked down the first few sections. By this time the grass had grown over some of his skid marks. 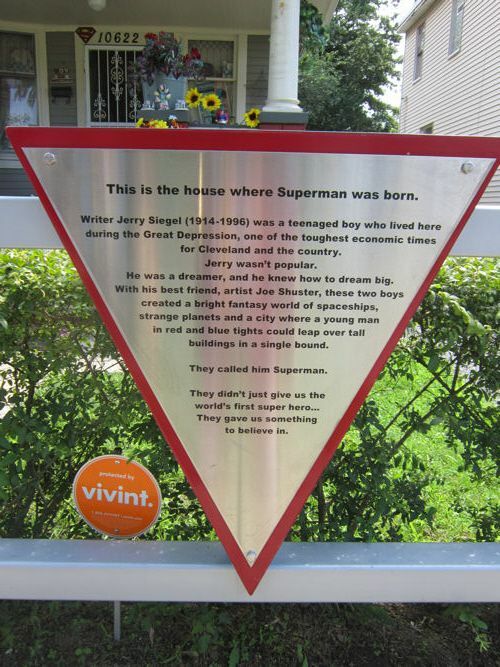 On a street corner a few more blocks down the road, a “Home of Superman” marker regales one and all with the story and its significance. Snapping photos of that plaque was an odd moment in itself. As we arrived and parked across the street at a drugstore, a preacher with a microphone was spending his Saturday afternoon outside this very courtyard, delivering a sermon to a few gathered listeners. He spoke passionately against this fallen world using a scene from The Godfather to illustrate his point. …and then he paused for a long, long minute while a pair of out-of-town yokels walked right up from across the street, took photos of this incidental landmark as if nothing else were going on around them, and scampered away before anyone could threaten to chase them away. Really, it’s nothing Clark Kent and Lois Lane wouldn’t have done in the pursuit of a story.